So I’m totally addicted to knitting now. I remember when I learned to crochet some 10 years ago and thought “how cool is this…I MADE something!” I was addicted to crocheting back then. And then The Younger got mobile, got curious, and discovered how fun it is to unravel yarn. I hadn’t gotten back into it again until recently and after yarning a few Christmas presents, decided to take a stab at knitting. My sister tried to teach me to knit about 8 years ago, but I couldn’t wrap my brain around throwing the yarn. I mean, I only have 2 hands! Every time I tried to throw, I dropped needles and numerous stitches that I painstakingly casted on in some awkward ugly way. Plus, I couldn’t re-train myself to hold the yarn in my right hand. I gave up and resolved that I was a crochet girl and I would leave knitting to the true fiber octopuses artists. Then I discovered the continental style of knitting (holding the working yarn in your left) and I got hooked…or maybe I should say, needled. I’ve completed a few projects before I decided that some were worth sharing the pattern. 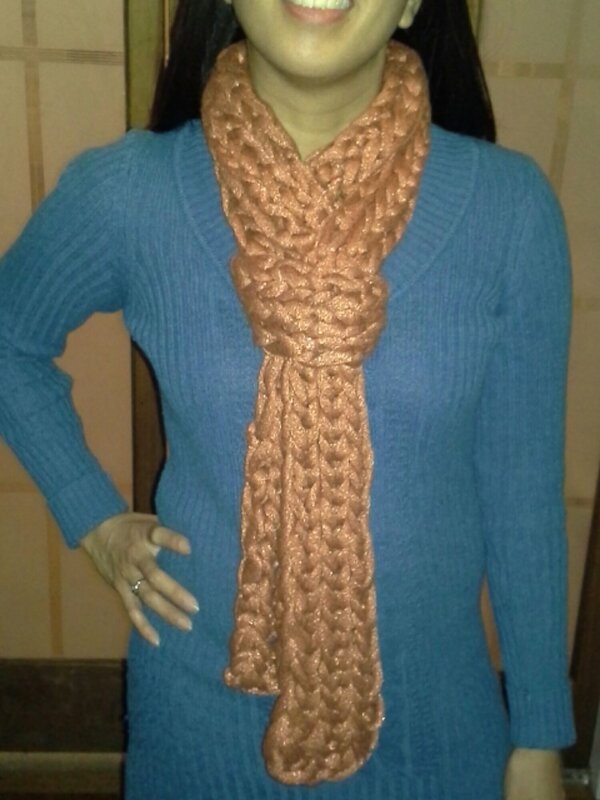 Here’s is my most recent completed project: a bulky skinny scarf! I started this, ripped it apart, started over, ran out of yarn, ripped it apart again, (Speed Stix are tricky) went to a different project, completed the other project, started ANOTHER project (incomplete), and decided to finish this before I lost heart. 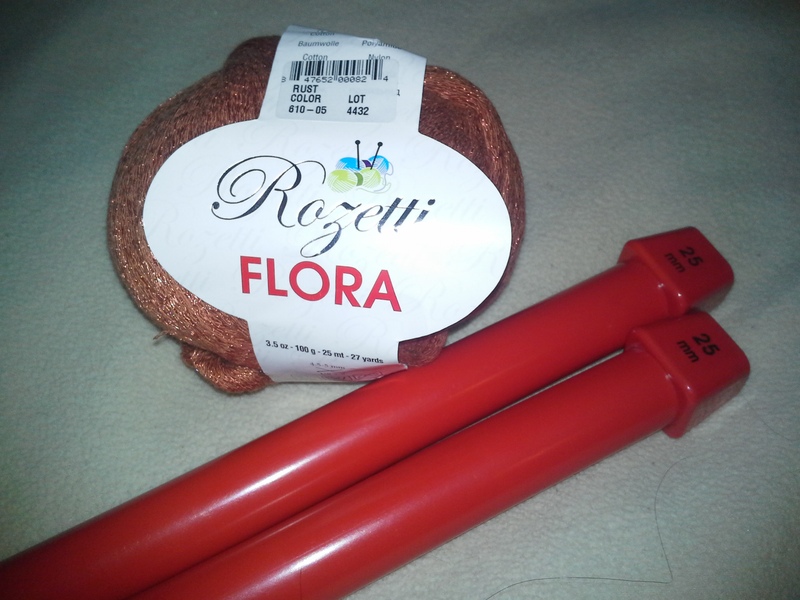 I used Lion Brand size 50 (25mm) Speed Stix and 3 balls of this yarn (Rozetti Flora in the color Rust). Originally, for ruffle scarves similar to sashay, but I wanted to use it as a super bulky yarn. It’s a solid yarn but has flecks of gold in it, so it isn’t booooring. Overall I’m pleased. I messed up a few stitches (purled where I should have knitted, or vv), but didn’t want to rip it up again so I just forged on in hopes they wouldn’t be noticed. One day I might also try to block it to even out some stitches. Maybe. Probably not. It has a lot of personality. What I like about this scarf is that it is warm without being too bulky around my neck. Some scarves make me feel like I’m wearing a bib or a cone of shame. This one makes me feel like I’m wearing a scarf. Two balls of the yarn might be enough. I used approximately 2.5 balls, and it’s about 7 feet long (I think skinny scarves look better long). I did experiment with the cast on edge. Since it was such a bulky yarn I wanted the cast on to look as pretty as the bound off edge so I crocheted it on. Similar to a provisional cast on but with only the 7 stitches and with the working yarn. It was stretchier on that end, but overall am still pleased. Hope you like this, and please let me know if you try it or improve upon it. Post or link to pictures! I wish I taken a picture of the scarf you got…but then I remembered that neither of us looked too hot that day. Bahaha! So what are you trying to say? You don’t like my natural, unshowered, look? Lol! Pretty! Where do you buy your yarn? Thanks! I got this at AC Moore. I have another scarf using similar yarn but different pattern. I’ll post that one too. I like ACM because they have a dollar bin. I’ll grab some for practicing swatches. Cute! I need to try this one!